Dietrich Bonhoeffer was a theologian, martyr, pastor, political dissident and author. He was known for his deeply intellectual theological writings and thought. Bohoeffer was arrested and imprisoned in a Nazi concentration camp and executed at the age of 39. This book is considered by many to be a classic of modern Christian thought. It was published in 1937 under the backdrop of the Nazi rise to power in Germany. 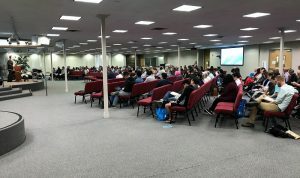 The book is focused on the Sermon on the Mount. Simply, Bonhoeffer outlines what it takes to be a Christian. Bonhoeffer’s book unswervingly challenges those who call themselves Disciples of Christ. 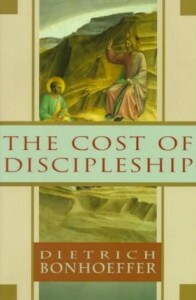 Discipleship is very simple and clear, yet discipleship is expensive and should cost us dearly. Those who declare Bonhoeffers theology unrealistic or unobtainable don’t understand the Scriptures. Christ did not ask for Sunday-only Christians, he called us to sacrifice all. This book is a gut punch and unbelievably informative. In one of the most quoted sections of this book Bonhoeffer explains that cheap grace is the preaching of forgiveness without requiring repentance, baptism without church discipline, communion without confession, absolution without personal confession. Cheap grace is grace without discipleship, grace without the cross, grace without Jesus Christ, living and incarnate. This book is one of the most thorough explanations of what it means to be a Christian. Bonohoeffer does not tell us that a Christian must simply pray a prayer, put a fish on his car or attend a conference. Bonohoeffer details the life altering, radical obedience and unwavering dedication that is required of a Christian. Longtime theologians and new believers alike should read this book. Check your modern views of Christianity at the door.